Ask any mother of a newborn what she wants in life and you’ll hear two answers: “sleep” and “10 minutes to myself to take a shower.” I’m currently blessed with a 6-week-old baby boy, and I’m in the thick of sleep deprivation and fatigue. 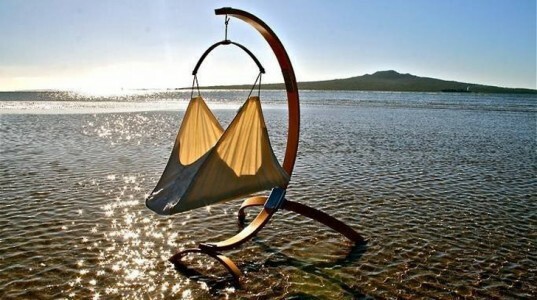 So when I was offered the opportunity to test-drive the new Hushamok organic baby hammock, I jumped at the chance. 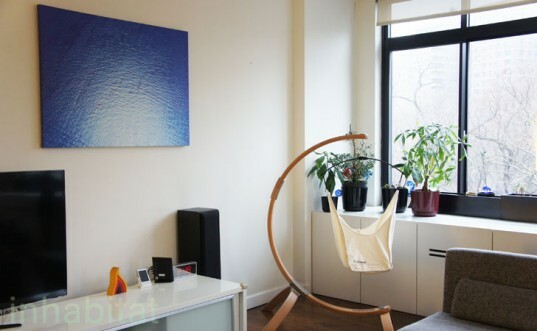 The Hushamok hammock / baby bassinet, which hangs from an elegant C-shaped wooden Okoa stand, promises restful sleep for your newborn, and – I’m happy to say – delivers in that department while also impressing friends with its sleek designer looks. Even better, it’s natural, organic, safe and VOC-free, and beats a swing-o-matic in a beauty contest any day. 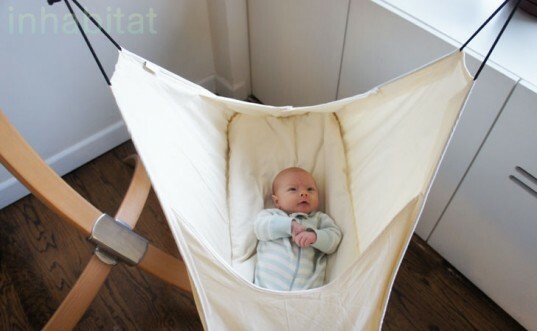 Read on to see my full review of the Hushamok baby hammock. Most new parents are familiar with the concept of the “4th Trimester” – the idea coined by popular pediatrician and author Harvey Karp (of The Happiest Baby On The Block fame) that newborn babies under 3 months aren’t quite ready to be outside the womb yet, and that anything that mimics their original home inside mama’s belly will be the most soothing environment for them. Judging by the popularity of his books, Karp is clearly on to something with his “5 S techniques”: swaddling, swinging, sucking, shushing, and stomach/side-lying. Of course, Karp certainly didn’t invent any of these tactics; all have been employed by exhausted parents throughout human history to calm babies and lull them to sleep. The “swinging” technique – gently rocking baby side to side – is a time-honored rite of passage for any parent of a newborn, but arms often get tired, and most contemporary swing-o-matics are garish, battery-operated, motorized devices made of synthetic, off-gassing materials. Happily, the Hushamok swinging hammock comes to the rescue for tired parents who want a baby swing that looks good and is safe and gentle for their newborn. 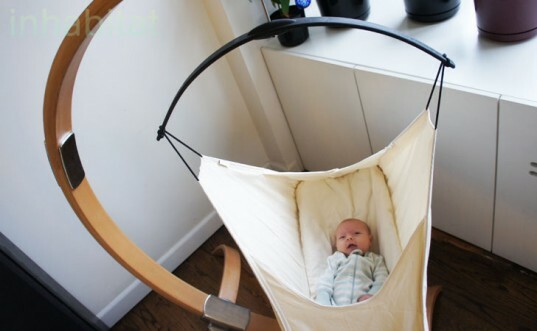 The Hushamok organic baby hammock is designed to create a hands-free, peaceful solution for getting babies to sleep with a unique suspended design that enables a natural rocking motion which is effective in soothing fussy babies and keeping them asleep. 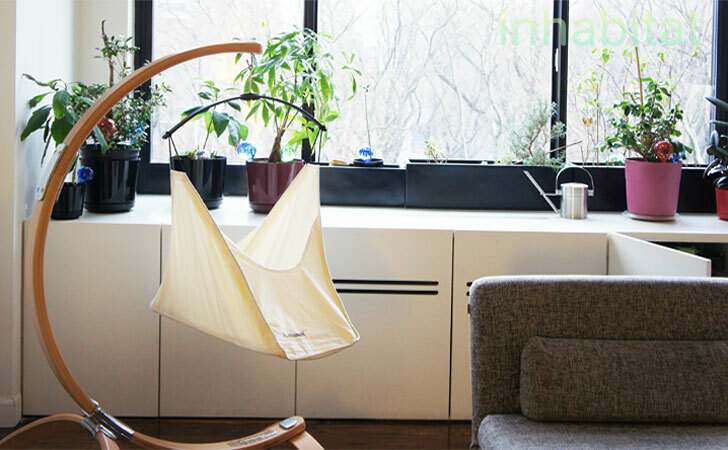 The Hushamok is made up of two key components: an organic baby hammock that attaches to a hook, and a beautiful, C-shaped ‘Okoa stand’ made from untreated European beechwood. I must say when I first realized how gigantic the Okoa stand was (midway through assembling it), I was slightly nervous about where it would fit in my living room. However, once I found space for it, I was surprised to discover that it is the first thing that everyone notices and comments on when they walk in the front door! My baby seems to dig it too. He’ll sleep much longer in the Hushamok than he sleeps in his bed, and I regularly use the hammock as my go-to baby repository when I need to take a shower, change my clothes or wash dishes. Unlike many mattresses and cribs found on the market today, none of Hushamok‘s mattresses or stands are treated with toxic chemicals or flame retardants that could be harmful to a baby. The bedding that comprises the hammock is completely organic and machine washable, and the stands are constructed using sustainably harvested, untreated European Beechwood and aluminum castings. I’m happy that the construction of the Hushamok hammock is so high quality and safe, as I’m concerned about indoor air quality and health, especially in regard to my little munchkin. 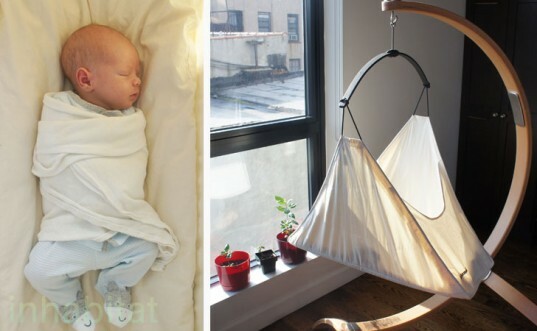 The attention to detail in the design of the Hushamok really shows: the elegant modern hammock looks more like a carefully crafted work of art than baby gear. I’m grateful I got the chance to check out a Hushamok hammock. It has brought some much needed shut eye and convenience to my family. I really wish I had one of these for my kids when they were babies! It would have made life so much easier! Too bad they can't figure out a way to have this transition into an infant swing, toddler swing, etc. Before long that newborn will be sitting up and trying to crawl out. Love the design and it looks so cozy! I love this concept! Been thinking about maybe getting one -- and this post is definitely swaying me in that direction. :) Thanks for sharing! Ask any mother of a newborn what she wants in life and you'll hear two answers: "sleep" and "10 minutes to myself to take a shower." I'm currently blessed with a 6-week-old baby boy, and I'm in the thick of sleep deprivation and fatigue. So when I was offered the opportunity to test-drive the new Hushamok organic baby hammock, I jumped at the chance. 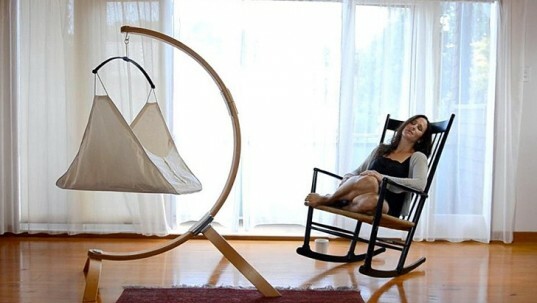 The Hushamok hammock / baby bassinet, which hangs from an elegant C-shaped wooden Okoa stand, promises restful sleep for your newborn, and - I'm happy to say - delivers in that department while also impressing friends with its sleek designer looks. Even better, it's natural, organic, safe and VOC-free, and beats a swing-o-matic in a beauty contest any day. Read on to see my full review of the Hushamok baby hammock.